A nice review of FRUITVALE STATION with an interview of Ryan Coogler, the filmmaker. I can remember, back in January of 2009, starting the New Year as many do with new goals set, new expectations for myself, and the feeling of a fresh start. Then several days later, I was one of many persons who viewed a terrible tragedy on a YouTube video. It was a haunting and poignant reminder of how precious life is and how sudden it can be taken. I’m of course referring to the death of 22-years-old Oscar Grant III, who was murdered on January 1st, 2009 by a BART (Bay Area Rapid Transit District) police officer at the now infamous Fruitvale subway stop in Oakland, CA. Oscar was removed from the train by BART officers, after he fought with rivals, and was shot in the back while lying face down on the train platform. One of the best “I got a Versatile Blogger Award” announcements I’ve read! What is an ugly picture? How about a mug shot? After all such pictures possibly personify best what is ugly in human society. 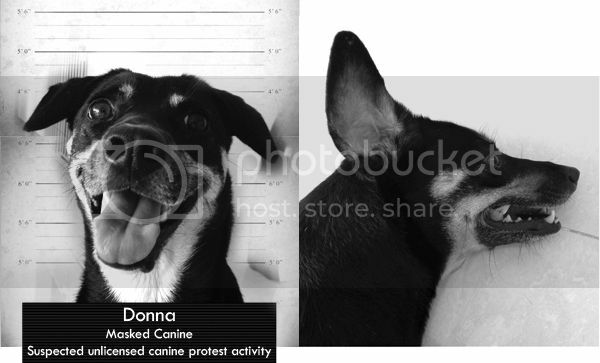 Singapore – Donna the local mongrel who was previously turned in for investigation by the authorities for the first suspected unlicensed protest to be staged by a dog in this country has fled. It is rumoured that the dog police whispered in embarrassment the statement that Donna the local mongrel, made her escape when wardens let her out in the yard to read her pee-mail. The authorities do not have an answer as to why the local mongrel held in custody should have access to pee-mail or any kind of communications with the dog network. They have refused to comment for this news report. 61 visits from Spain yesterday; 13 so far today. Here is what is viewed, I think! Many thanks to Fel Wetzig at The Peasants Revolt! (http://www.scotzig.com) for my first Versatile Blogger Award – totally amazed and very grateful. The Award is really surprising as I struggle to blog as often as Fel and many others. You are currently browsing the archives for the Awards category.